For the first time, a reference book explains the traditional methods of Japanese tool, knife and sword makers and gives an insight into their workshops. Richly illustrated with ten typical examples from razors to swords, the history of the production process of these impressive forged workpieces is explained. 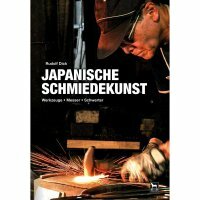 Chapters on Japan's oldest coppersmith and traditional Tatara steel smelting complete this unique documentation. An indispensable work not only for amateur and master blacksmiths, but also for all admirers of Japanese craftsmanship.